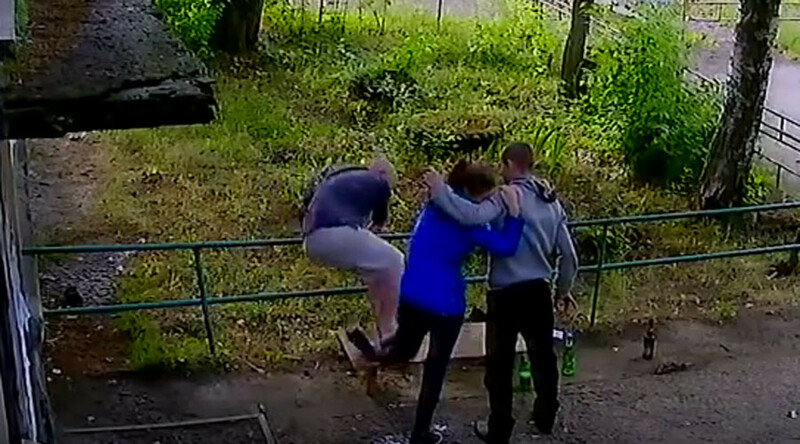 A woman in the town of Nizhny Tagil, the Urals, asks her seemingly drunk friends to break her leg... and one of them does it right away. The incident happened last July, but the footage was only obtained a few days ago by a local news portal TagilCity.ru. The video shows two men and a young woman sitting on a bench drinking alcohol. Then, one of the men and the woman apparently start discussing her legs, according to the news outlet. Afterwards, the woman stands up and steps on to the bench – getting ready for what proves to be a truly graphic experience. One of the men jumps on her leg. The leg bends shockingly, and everyone falls to the ground: the woman, the man who held her, as well as the bench. A neighbor who witnessed the incident’s aftermath shared what he saw with TagilCity.ru portal. Later on, the neighbor learnt that the woman had deliberately asked for her leg to be broken, and was astonished. “Well of course, things happen in the summer, but breaking a leg, with the victim agreeing to it, is new and completely crazy,” he added. The local police couldn’t comment on the incident, saying the woman may never have contacted them.